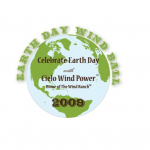 Texas-based Cielo Wind Power continues their Earth Stewardship Scholarship Award program to students in Texas, Oklahoma and New Mexico. Vega, Texas – Cielo Wind Power, LP of Austin, Texas – the largest independent wind power company in the United States – continued its support of students and education by pledging $20,000 in scholarships to school districts throughout Texas, New Mexico and Oklahoma. Award recipients were honored at Cielo’s annual Earth Day Wind BallTM held outside Amarillo, Texas on Saturday, April 18, 2009 as part of Earth Day and National Environmental Education week. Students were asked to write an essay describing their responsibility as earth stewards and how they will continue to pursue that responsibility in their education and career plans. “The stewardship scholarship is a great way for Cielo to give back to local communities and recognize outstanding students who demonstrate a commitment to land stewardship.” said Walt Hornaday, President of Cielo Wind Power. Cielo recognizes the need for environmental education and was excited to bring an eco-friendly event to the Panhandle of West Texas. In keeping with Earth Day, guests received Ponderosa Pine seedlings to be planted throughout the Panhandle region providing shade, habitat for wildlife and a natural wind break. Rory Schepisi of Boot Hill Saloon in Vega, Texas, provided the evening’s menu of organic beef tenderloin along with a tasty dessert and coffee bar. Attendees included scholarship winners and their families, representatives from local schools and businesses, land owners, county judges and commissioners. Scholarship recipients include Shelley Fangman of Vega High School; Jeremy Martinez of Robert Lee High School; Jordan Rawles of Sterling City High School; Anna Rebecca Johnson of Adrian High School; Caitlin Gulihur of McCamey High School; Cheyenne Christian Coy of Ozona High School; Grant Pope of Rankin High School; Amelia Taylor of Clarendon High School; Trent Daniel Britten of Groom High School; Skyler Michele Conatser of Hedley High School; Chase Bohler of McLean School; Keslie Satterwhite of Panhandle High School; Tim Poland and Thomas Rapstine of White Deer High School; Kaitlin Rae Lopez of Tucumcari High School in New Mexico and Heather Ann Habekott of Woodward High School in Woodward, Oklahoma. Cielo is a privately held company based in Austin, Texas that develops, owns and operates wind power facilities in the southwest. Wind RanchTM is a registered trademark licensed to Cielo and represents the ideals the company embraces in taking necessary steps to minimize the impact of wind projects on farming, ranching and natural uses of the land.